A brass sign above reception in the 18th-century Clachaig Inn at the foot of Glen Coe reads starkly: ‘No hawkers or Campbells’. The memory of the apparent treachery of the Campbells, who rose up and slaughtered their hosts the MacDonalds here in 1692, is obviously still fresh. Today, of course, the message is left more for the amusement of tourists than in any sense of lasting revenge. It was in early February that about 120 members of the Earl of Argyll’s Regiment of Foot under the command of Captain Robert Campbell of Glenlyon were billeted on the MacDonalds in Glen Coe, who received them with traditional Highland hospitality. But Campbell was acting under the orders of the Secretary of State for Scotland and Lord Advocate, John Dalrymple, who was annoyed that Alastair Maclain, Chief of Glen Coe, had been late in pledging his allegiance to the new monarchs, William and Mary. The massacre began simultaneously in three settlements – Invercoe, Inverrigan, and Achnacon – although the killing took place all over the glen as the fleeing MacDonalds were pursued. A total of 38 members of the clan were slaughtered, and another 40 women and children died of exposure after fleeing into the hills when their homes were burned down. The Victorians, with their unrestrained taste for the melodramatic, dubbed Glen Coe “the Glen of Weeping,” and novelist Charles Dickens hated the place, claiming its very recollection made him shudder. Glen Coe was, he wrote: ‘perfectly terrible’, and ‘an awful place… there are scores of glens, high up, which form such haunts as you might imagine yourself wandering in, in the very height and madness of a fever’. 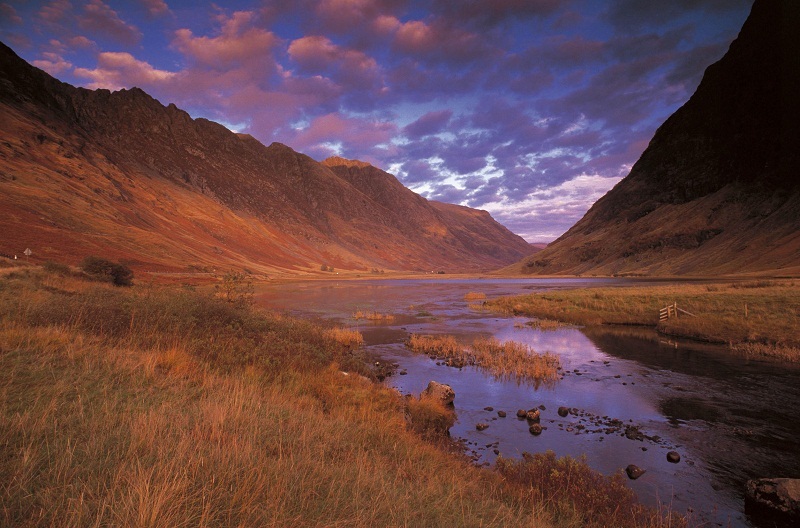 Inescapably associated with the 17th-century massacre, Glen Coe is one of the great scenic experiences of Scotland. It is now owned and managed by the National Trust for Scotland, which has an excellent visitor centre in the lower part of the glen. The melodramatic valley of Glen Coe is undoubtedly one of Scotland’s greatest scenic gems, and with Ben Nevis, the highest mountain in Britain standing at 4,406ft it forms the heart of the 400-square-mile National Scenic Area (NSA) of Ben Nevis and Glen Coe. The NSA covers the western extremity of the Grampians from Glen Spean in the north to Glen Kinglass in the south. The eastern boundary is marked by the remote outpost of Rannoch Station on the West Highland Line on bleak Rannoch Moor, and the western, by the mouth of Loch Leven beyond Ballachulish. Coming from the south, you approach the NSA on the A82 from Glasgow and Loch Lomond across the barren, lochan-strewn wastes of the National Nature Reserve of Rannoch Moor. Ringed by the great mountains of the Black Mount, it is perhaps the most desolate and godforsaken scene in the whole of Scotland. The perfect mountain cone of Buachaille Etive Mor (the Great Herdsman of Etive) stands sentinel at the entrance to Glen Coe as the motorist completes the 10-mile traverse of Rannoch Moor. It reminded Murray of a Gothic cathedral or a Neolithic arrowhead, and in his classic Mountaineering in Scotland, published in 1947, he unequivocally described the Buachaille as “the most splendid of earthly mountains”. On its northern side, Glen Coe features the ultimate scramblers’ challenge of the six-mile notched ridge of the Aonach Eagach, which is faced across the glen by the series of truncated spurs known as the Three Sisters. These bold bastions run down from Bidean nam Bian, at 3,743ft the highest mountain in Argyll, like the clenched knuckles of a fist. Hidden between the first and second of the “Sisters”, Beinn Fhada and Gear Aonach, lies the fabled Lost Valley of Glen Coe: Coire Gabhail (pronounced “Corry Gale”). Traditionally Coire Gabhail (it means the hollow of capture) was where the MacDonalds hid the cattle stolen from their neighbours in the days when cattle-rustling was something of a croft-industry in the Highlands. Certainly the broad green sanctuary of it is well hidden from the old road, which passes through the glen far below. At a height of about 1,200ft, the flat, green meadow floor of Coire Gabhail is enclosed by the precipitous walls of Gear Aonach and Beinn Fhada, which sweep round to the great buttresses at the head of the valley and the pass of Bealach Dearg, eventually leading up to the unseen summit of Bidean nam Bian. And if you are really lucky, as I was on my first visit, you’ll be greeted by the magnificent sight of a golden eagle soaring effortlessly on fingered wings above the bealach. Neighbouring Glen Etive may not have the same awe-inspiring grandeur of Glen Coe, but it is guarded at its northern end by the imposing twin bastions of Buachaille Etive Mor and Ben Starav, and threaded by the beautiful, pine-fringed River Etive. The scenery of the Glen Coe-Ben Nevis NSA is characterised by a diversity based on its geology. Granite dominates the Ben Nevis, Glen Etive and Rannoch Moor areas, while Glen Coe is mainly of volcanic origin. This complicated geology creates landforms which vary from hills which are smooth and grass-covered to others containing jagged and precipitous crags, like the northern face of Ben Nevis, which provides some of the hardest rock, snow and ice climbing routes in Britain. No other part of Britain has greater relative relief than Glen Nevis, which runs south then east from the former Georgian garrison town of Fort William (excluded from the NSA), under the massive southern shoulder of Ben Nevis. Many people have compared the wooded middle section of the gorge created by the Water of Nevis to a Himalayan valley. From the pastoral lower reaches, the glen climbs through glorious oak, alder, pine and birch woodlands on a narrow path above the boiling, rushing waters of the river. The upper glen is a place of peaceful, almost alpine, meadows, enhanced by the backdrop of the tremendous 350ft leap of the Steall Waterfall as it crashes down the lower cliffs of Sgurr a’ Mhaim. To reach the waterfall, you have to cross a vertiginous, three-strand wire bridge over the rushing Water of Nevis. The glen is walled to the south by the smooth-sided ridge of the Mamore Range, which includes 14 “Munros” (Scottish peaks above 3,000ft), and south of that is the fjord-like trench of Loch Leven, with the former aluminium plant industrial village of Kinlochleven at its head. The northern side of Ben Nevis is dominated by what Murray called “the most splendid of all Scottish corries” – Coire Leis – which is flanked by Cam Mor Dearg, Aonach Beg and the tremendous northern buttresses of Ben Nevis. Here stands the CIC Hut, a refuge for generations of climbers on ‘the Ben’, and built in 1929 as a memorial to mountaineer Charles Inglis Clark, who died during the First World War. It is now maintained by the Scottish Mountaineering Council. The usual “tourist” route to the summit of Ben Nevis ascends gradually from the Glen Nevis Visitor Centre near Achintree up to the broad saddle which contains Lochan Meall an t-Suidhe (the Half Way Lochan). It is known as the Pony Track because it was constructed in 1883 to get building materials to the summit for the Observatory. Then a steep and fairly arduous series of zigzags takes you up the broad west face of the Ben, to eventually reach the relatively flat summit and the ruined remains of the Observatory and summit cairns. The route is about five miles in length, but it involves 4,000ft of ascent and is a serious undertaking, taking the average walker between three and four hours, although fellrunners have done it, there and back, in less than two hours. Around 125,000 ascents of Ben Nevis are reckoned to be made every year, ranging from charity walkers to eccentrics who have taken wheelbarrows and even a piano to the top. It was conquered by a Model T Ford as a publicity stunt as early as 1911.